Super bike racing is possibly one of the most exciting events to witness first hand. Today's current 600cc, 750cc, and 1000cc sport bikes that are available at any motorcycle dealer and are pure bred race machines. Once these super bikes are unleashed onto a closed course for competition, their true heritage can be seen. Skilled racers pilot these super bikes around the track with the intent of one thing: getting to the checkered flag first. SMRI maintains track records for the two configurations of Sandia Motorsports Park it runs. Also known as the ULGP, this is the SMRI's premier race that features a cash purse paying down to 3rd place: 1st – 50% of the purse; 2nd – 30% of the purse; 3rd – 20% of the purse. This is the "Anything Goes" class, featuring the fastest motorcycles and racers in New Mexico. These are races featuring class specific motorcycles. Since each class is engine size specific, spectators watch some of the closest and most exciting racing in New Mexico. Watch as our members enter turn 1 at 110 mph, knee down, 3 riders wide on 600cc machines. 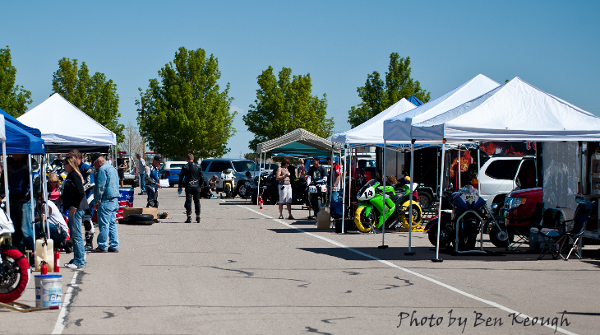 Our Middle Weight Super bike class is one of SMRI's more popular events due to Sandia Motorsports Park's tight and technical nature. The Formula 1000 and Open Super bike classes field machines that produce up to 200 hp! Watch as our riders smoke up the rear tire coming out of the ultra-fast turn 7, drag racing to the checkered flag. This is a 2 Heat format race that is geared toward beginning racers. Bike tech requirements are the same as a track day... basically tape up your mirrors, take off the license plate and you are ready to go. No championship points are awarded in this class, but there are bragging rights! A vintage bike racing with SMRI can be one that was built as late as 1978 for one of the Historic Vintage classes or as recent as 1983 for the Super Vintage class. If you have an older European, Japanese or British bike, chances are excellent it will fit into one of the vintage classes. SMRI is the most supportive regional club for racing these older motorcycles in the desert west, so if you live in Arizona, Colorado, Utah, Texas or New Mexico, racing your vintage motorcycle with SMRI is the best place to be. SMRI has four classes for Historic Vintage, and a fifth class for newer vintage bikes called Super Vintage. Historic Vintage has ultra-lightweight, lightweight, middleweight and a heavyweight class. 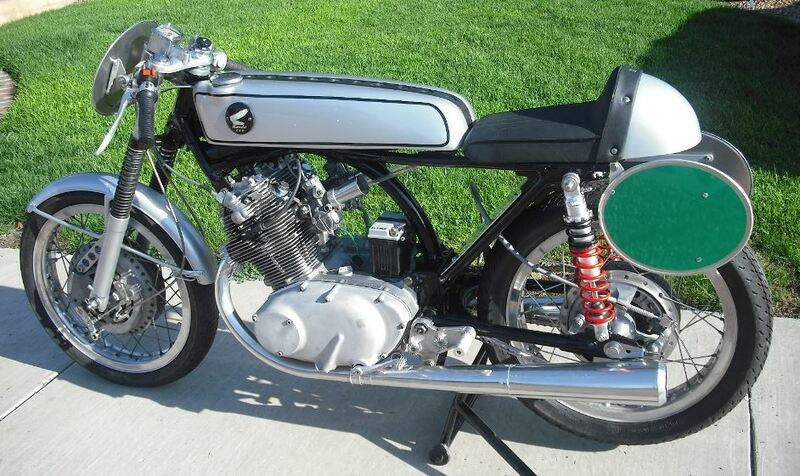 If you have a 350 Honda twin or a CB450, you could race it in the Historic Vintage Lightweight class. If you have a Yamaha XS650, a Honda CB500 four, or a Norton or Triumph 750, the middleweight class is for you. If you have an early Honda CB750 four, old Kawasaki Z1 or a Suzuki GS1000 from the 70's, you could race it in the Heavyweight Historic Vintage class. All the Historic Vintage bikes are eligible for the Super Vintage class, where you could also race a Honda CB900F, Kawasaki GPz550, or even a first generation Honda Interceptor. What is needed to begin road racing?? How much does it cost?? 1. A bike - One of our goals is if you bring any kind of bike to the track, you will have at least 3 classes you can run in. 2. A race license - We honor other clubs license. If you do not have a race license, you will need to take our race school ($180) to obtain yours. More information on the race school can be found here. The price of the race school includes entry into our Super Street Class, a 2 Heat race that feels like two separate races! 3. AMA Membership - Since we are AMA sanctioned, all riders must be AMA members. You can sign up online for $49/yr or we can sign you up at the track for an additional $6. Go to http://www.americanmotorcyclist.com/membership/join to sign up. 4. SMRI Membership or Single Day License - SMRI Membership is $125/yr. Single Day License is $40. 5. Race Entry Fees - We have a tiered pricing structure. The first race is $80, two cost $145, three are $195, and for $225 you can race as many races as you can fit into a day!!! For less than $350.00, you can get your race license, race in two races (Super Street is a 2 heat race) and become an AMA member. We even have leathers to rent if you need them. See Rule Book to learn all about what you have to do to compete in SMRI Roadracing Events and to become a motorcycle roadrunner. See Roadrace Event Schedule to see when you'll need to be at the track, when you'll be able to visit Registration and Technical Inspection, when we'll hold the MANDATORY Riders' Meeting, and when you'll be racing! See Racer Licensing School to learn more about the process for first time racers to get their SMRI Racing License by attending the SMRI Race License School. See Recent Results to see who won each class at the most recent racing event and see Championship Standings to see the current SMRI Championship standings. See Contingency Program to learn how you can help support your potentially expensive motorcycle roadracing career. See Class Sponsors to learn which businesses support SMRI roadracing and how you can support them.